Breaking Bad airs in Australia just 5 hours after it does in America. Earlier in the year, it was revealed that Australians pirated Game of Thrones more than any other nation. 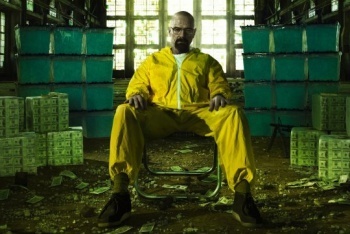 Now it looks like Australia has come out on top again, with Australia topping TorrentFreak's list of biggest Breaking Bad pirates. Australia only barely beat out the USA, taking 16.1% of all Breaking Bad torrent traffic compared to the US's 16%. Melbourne (a city in Australia) had the largest piracy percentage in a single city at 4.8%, with London following at 3.5%. Previously, it was easy to point to the lack of legal alternatives as a reason for Australian's to pirate. This is indeed still the case for many TV shows, including the recent Season 4 of Arrested Development, which still is not legally available for Australians to purchase from any outlet, but the Breaking Bad crew have been trying their best to remedy this solution. Breaking Bad airs in Australia just 5 hours after it does in America on pay TV service Foxtel, and is available for download via iTunes. However, a recent controversial policy by Apple effectively forced users who had purchased a Breaking Bad season pass to re-purchase the second half of the fifth season. For fans who don't want to buy into Foxtel's pay service, iTunes is the only legal outlet for Breaking Bad. Australians also routinely pay considerably more for digital goods than Americans, a problem that is now facing a national inquiry. So, while it's easy to point at Australians and say "Har har, a country founded by convicts are now all pirates," you have to understand that they have been pushed around with American TV shows for a long time. Legal alternatives are often slow, expensive, and only arise once the show reaches the level of "mega-popularity" that shows like Breaking Bad and Game of Thrones have achieved, so you can understand why Australians would want to give these guys the middle finger and pirate.